When The Conjuring became a hit in 2013, it quickly spawned a spinoff franchise via 2014's prequel Annabelle. 2016’s Conjuring 2 introduced a new character who now becomes the focus of 2018’s The Nun. Set in 1952, Sister Victoria (Charlotte Hope) lives at an abbey in Romania. After some dramatic events, she kills herself. As a result, the Vatican sends Father Anthony Burke (Demian Bichir) to learn what happened. Along with novitiate Sister Irene (Taissa Farmiga), the pair find more than they expected as the investigation takes dark, supernatural turns. Prior to Nun, we got two Conjuring movies and two Annabelle flicks. These varied in quality somewhat, but I tended to find them to seem fairly mediocre. Because of this, I can’t claim I entered Nun with high expectations. If the first four films left me unenthused, why would Number Five alter that path? Short answer: it doesn’t. Despite some changes in the prior movies’ formula, the result brings a tale short on real terror. Like too many modern horror flicks, Nun relies a lot on cheap jump scares. While it attempts to build a dark, foreboding atmosphere, it lacks the confidence to develop fear in more subtle ways, so it resorts to quick jolts for most of its impact. These moments don’t succeed, mainly because they don’t boast the basic drama we need to care about the characters. While the movie attempts some development for Father Burke and Sister Irene, we never really invest in them, and the other expository bits add little as well. A better version of Nun would shoot for psychological horror and build on the alleged “cursed” nature of the abbey. While the movie relates those tales, it feels like window-dressing and not an especially engaging aspect of the story. Rather than leave something to the imagination, Nun ensures that it depicts the threat as literal, so we get no suspense. We know an evil being stalks the realm, so we never feel much real tension, as we’re aware that this creature will eventually be confronted. Because of this, Nun turns into more of a “monster movie” than anything else, and the choice doesn’t work. Again, this leads to little more than tedious scenes in which the demonic being attacks from the shadows, and these get old. I do think Nun comes with the potential to offer a chilling horror tale, and that makes it a disappointment. Heavy on cheap scares and light on deeper terror, the movie makes for a slow 96 minutes. 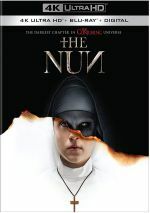 The Nun appears in an aspect ratio of approximately 2.40:1 on this Blu-ray Disc. As expected, the movie presented appealing visuals. Across the board, definition seemed good. Even with a mix of low-light sequences, the film appeared accurate and concise. In terms of palette, Nun went with a standard orange and teal orientation – one that emphasized the blue side of things. Within stylistic choices, the hues seemed well-depicted. Blacks were dark and dense, and shadows gave us good clarity most of the time. However, some low-light situations – of which the film featured many – could be a bit on the thick side. Even with those, though, I felt pleased with this transfer. As for the Dolby Atmos audio, it offered a mostly typical horror movie soundscape. Downconverted to Dolby TrueHD 7.1, this meant a fair amount of creepy atmosphere and occasional “jolt moments”. Along with good stereo music, the soundfield was able to open things up in a satisfying manner that embellished the story. We got a good sense of elements along with a useful sense of the spooky material, with some that worked really well. In particular, panning satisfied. A few scenes features components that moved around the channels, and these did so in a smooth, convincing manner. Audio quality was always good. Music appeared full and rich, while effects demonstrated nice clarity and accuracy. Low-end appeared deep and rich. Speech was natural and distinctive throughout the film. The mix used the speakers well and created a fine sense of the material. A few extras appear, and A New Horror Icon runs five minutes, 18 seconds. It includes notes from producers Peter Safran and James Wan, director Corin Hardy, writer Gary Dauberman, makeup department head Eleanor Sabaduquia and actors Taissa Farmiga, Bonnie Aarons, Jonas Bloquet, Demian Bichir, and Charlotte Hope. “Icon” discusses some story and character areas, with an emphasis on the design of the title role. It’s a short and semi-informative reel but nothing special. Next comes Gruesome Planet, a six-minute, 18-second piece that features Hardy, Wan, Hope, Bloquet, Farmiga, Dauberman, Bichir and production designer Jennifer Spence. “Planet” examines sets and locations, and it does so in a reasonably positive manner. With The Conjuring Chronology, we locate a three-minute, 50-second reel that includes Wan, Hardy, Safran, Aarons, and Annabelle: Creation director David Sandberg. “Chronology” mainly just shows clips from various “Conjuring Universe” and promotes Nun, so don’t expect much from it. Seven Deleted Scenes span a total of 12 minutes, 18 seconds. These mix some character beats and a few story elements. None of them seem crucial, but they may have added a bit of depth to the film. The disc opens with ads for Fantastic Beasts: The Crimes of Grindelwald, Aquaman and The Meg. No trailer for Nun appears here. 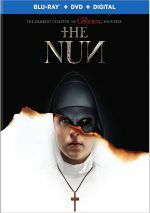 Essentially a monster movie wrapped up in religious garb, The Nun lacks much impact. A mix of creepy atmosphere and jump scares, the film fails to engage. The Blu-ray brings very good picture and audio as well as a few bonus features. Formulaic and tired, Nun goes nowhere.